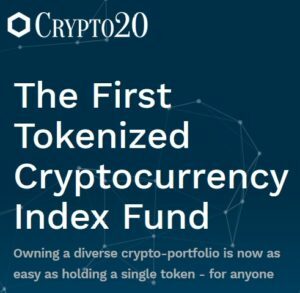 CRYPTO20 is the world’s first Cryptocurrency Index Fund giving individuals the opportunity to own a diversified crypto portfolio through one simple token, simplifying the previously complex world of interchangeable online currencies. Actively managed funds consistently fail to beat the market index despite decades worth of data, billions of dollars and hundreds of analysts at their disposal. When they have, their fees dilute investor returns to less than if they had simply held the index. CRYPTO20 originally raised $5 million in an oversubscribed pre-sale and the public token sale is currently running with over $8.6 million invested. With three weeks left to run, the team behind CRYPTO20 is expecting to build even further and hoping to cross the $10 million mark. As evidence of this fact, CRYPTO20 has released trading tools and insights that are generated live from the eight exchanges connected to the system via a simple, unified API. The trading tools are available in the fund investor portal and include information on slippage, the best price and trading pair to acquire assets with and the volume by exchange. The CRYPTO20 fund mitigates risk and volatility, and historically has provided better returns than the market cap leader, Bitcoin, alone. About CRYPTO20 CRYPTO20 is a crypto index fund that will use the ICO funding to buy the underlying crypto assets. No broker fees, no exit fees, no minimum investment and full control over your assets. Full blockchain transparency.